The beginning of September is my favourite time of the year. Even though we are in the middle of another heat wave, summer will soon come to an end. And for us, everything is going to change. After a long and very strenuous month long search, we finally found daycare for our daughter. (I still cannot believe how lucky we have been in the end.) Our one year shared parental leave is coming to an end when F. turns 1 in October. We will return to our jobs and try to get everything to work. This last year has been very different, very special, but sometimes it has also been exhausting. The next year will probably be another very different and maybe exhausting year, too. I am looking forward to it but then I am not. It’s going to be exiting. Until then, I am enjoying the change of season. I love September so much because when it comes to fruits and vegetables, this month offers the best from two seasons: summer’s berries, tomatoes, zucchini, but also autumn’s plums, figs, pears, parsnips, and the first pumpkins. This soup is made with both summer and autumn produce and it doesn’t matter if you still feel like summer or already like autumn. It is both creamy and comforting and light and fruity. You can serve it hot or cold, on it’s own or with a slice of your favourite bread and some added grains. Heat a large pot over medium heat. Add cumin, coriander, and cardamom. Toast for one minute, or until fragrant. Transfer spices to a bowl and set aside. Add oil, onion, cloves, bell pepper and rosemary to the pot. Fry for five minutes or until the onion is translucent. Add remaining ingredients (you can use vegetable broth instead of water, if you prefer) and bring to a boil. Cook covered for 10 minutes. Remove cover and cook for another 30 minutes over high heat to reduce the liquid a bit. Transfer to a blender and purée until smooth (if you think your blender can’t handle the rosemary, remove before blending). Serve with bread. Thanks for this recipe! My non-vegan husband said it was the best tomato soup I’ve ever made. Thanks, Amy! I am very happy to hear your husband liked the soup! 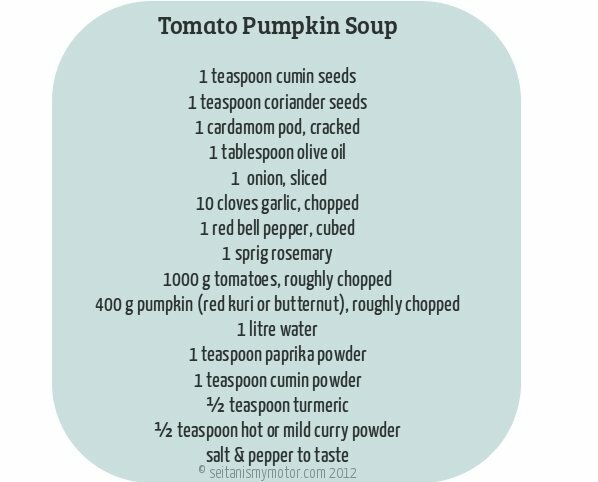 This looks so good and while I’m not a huge fan of pumpkin soup, the addition of tomato means I want to try this! I love the way this soup marries the seasons–two of my favorite things blended into one. Definitely bookmarking for this weekend! And, wow, Germany seems amazing re: parental leave–1 year off, what a blessing. Best of luck transitioning into year 2!! This looks so good! Yum.. I love the spice mixes you are using. I love how, quite literally, you’ve combined both Summer and Fall in this soup. I don’t know if I’ve ever seen a dish quite like it! I am more than tempted to try this one out! Noch eine kleine Anmerkung: Du hast oben die Zutaten nicht geschrieben, sondern als Bild eingefügt. Das sieht zwar hübscher aus, hat aber den großen Nachteil, dass man es nicht zum Drucken kopieren kann. Auch können Menschen, mit Sehbehinderung, die einen Screenreader verwenden, das nicht lesen. Das wusste ich nicht. Vielen Dank für den Hinweis! I’m kind of not ready for the end of summer. But I’ll still take the soup. I hope the new months to come will be an easy transition for all of you! Looks cozy and tasty – perfect with the crusty bread. Welcome Fall! The fall is my favourite season. Glad to hear you found care for your wee one, takes a lot of stress out of the equation. I love pumpkin everything! I like the curry twist on your soup. Nooooooooo! I’m not ready for summer to end. As much as I love pumpkin soup, I’m already suffering from berry withdrawal. This soup looks gorgeous! 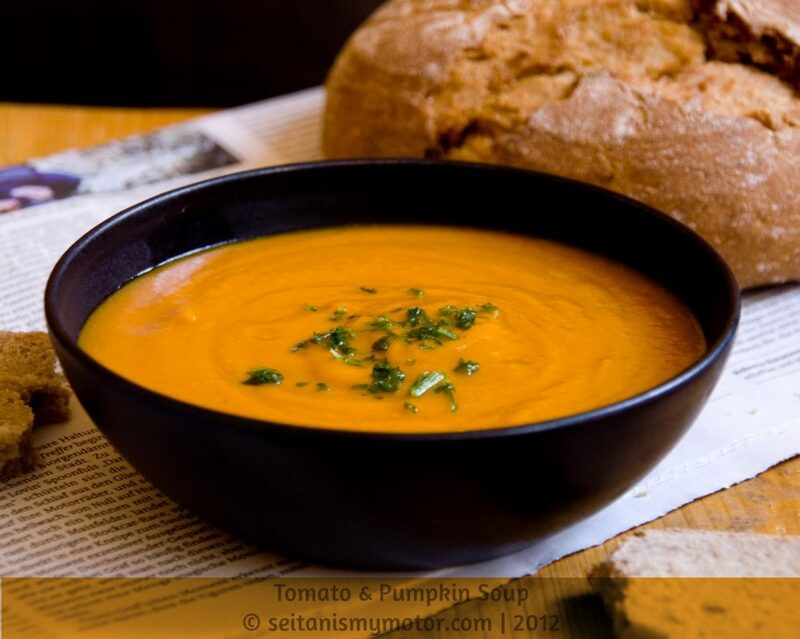 Pumpkin soup is definitely one of my favourites and your version sounds wonderful with all those spices and vegetables. I’m loving this time of year as well – tomatoes and pumpkins! It’s going to be very hard for me to accept the end of summer — I love heat and sunshine and am not looking forward to rain and chill. If anything can add a cheery note to the season, it’s pumpkin soup — especially if it contains fragrant toasted spices. Your soup looks so good. I’ve never added tomatoes to pumpkin soup and am curious about the taste. Hope all goes smoothly as little F transitions to daycare. I can’t believe she’s almost 1 already. She and I share a birthday month. My birthday is in October, too. It’s a great month, isn’t it? I AM SO NOT READY FOR SUMMER TO END! Pumpkin soup is indeed the very king of soups and when it comes to autumn he reigns supreme! What about just a dash of coconut milk or a couple of tbs of vegan yogurt at the end just for a little creaminess? Looks lovely.